Last week, Mark Napier of Urban LandMark and I submitted a letter to the Business Day, commenting on two letters that had been debating the value of RDP housing and title deeds. Here is the full text of the letter. The edited version of the letter as it appeared in the newspaper can be downloaded here. 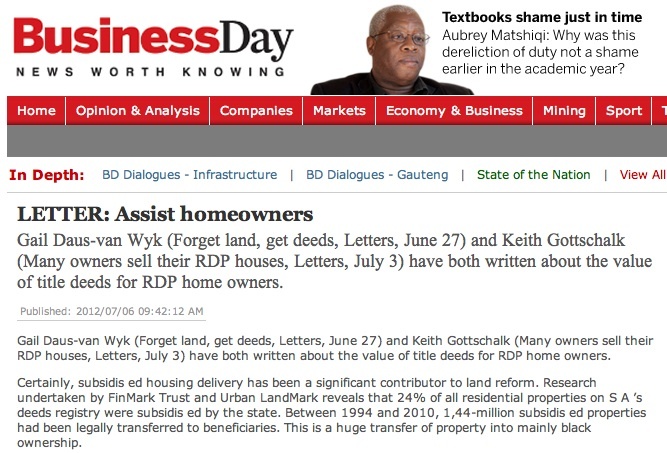 Gail Daus-van Wyk and Keith Gottschalk have both written about the value of title deeds for RDP home owners, responding to the article by Stephen Grootes on the land reform debate. Certainly, subsidized housing delivery has been a significant contributor to land reform. Research undertaken by FinMark Trust and Urban LandMark reveals that 24% of all residential properties on South Africa’s deeds registry were subsidized by the state. Between 1994 and 2010, a total of 1,44 million subsidized properties had been legally transferred by the state to beneficiaries. This is a massive transfer of property into mainly black ownership. However, the research also found a significant backlog in the delivery of title deeds into the hands of the legitimate owners. Anything up to 50% of the title deeds for the subsidized houses had not been transferred to the beneficiaries, many of whom are already living in them. If these beneficiaries had received title deeds, the proportion of subsidized property on the national deeds registry would have been 38% of the total number of properties in the country – not an insignificant proportion. Clearly there is work to be done in addressing the backlog and conferring property rights that have been promised. But what do subsidy beneficiaries do with their property once they receive titles? Whether they use it, as Daus-van Wyk suggests, as de Soto-style capital to raise finance for small business development (and the research does show that a few people do), or sell it for less than the government paid, ‘cashing out’ so to speak, as Gottschalk suggests is the norm, is surely a choice that arises from the information available to people, and the inherent value in the asset they’ve been ‘given’. Our research found that most households who had received formal title deeds do invest in their housing, extending or otherwise improving the house so that it better suits their needs. While some do this to improve financial value, others are simply seeking to improve comfort. In this, investment choices are not dissimilar from other South African property owners. While the research on ‘cashing out’ is not conclusive (respondents said they were fearful to confess to transactions which government classifies as illegal! ), it appears that the choice to sell is not, as Gottschalk suggests, for immediate consumption income, but rather to facilitate mobility for job searches, or to respond to other life needs. Houses ‘given’ to unemployed who are unable to raise finance to develop these homes further, e.g. my family owns properties in the township with potential to develop back yard rental units (cottages) to earn passive lifetime income. However Banks and government funding agencies will not fund such ventures. Hi Leteacha. If you qualify for the individual subsidy, earning a household income of less than R3500 per month, you don’t have to pay it back. The time it takes all depends on your municipality – not all municipalities offer the individual subsidy. Speak to your municipality, or your province, and ask them about the procedures and conditions for the individual housing subsidy. Good luck!